Purple, orange and yellow hues often light up the night sky in Kingsville and Leamington because of the cluster of greenhouses that fill the region. Purple, orange and yellow. Those are some of the colours that light up the night sky in Kingsville and Leamington at times, all because of the cluster of greenhouses that fill the region. 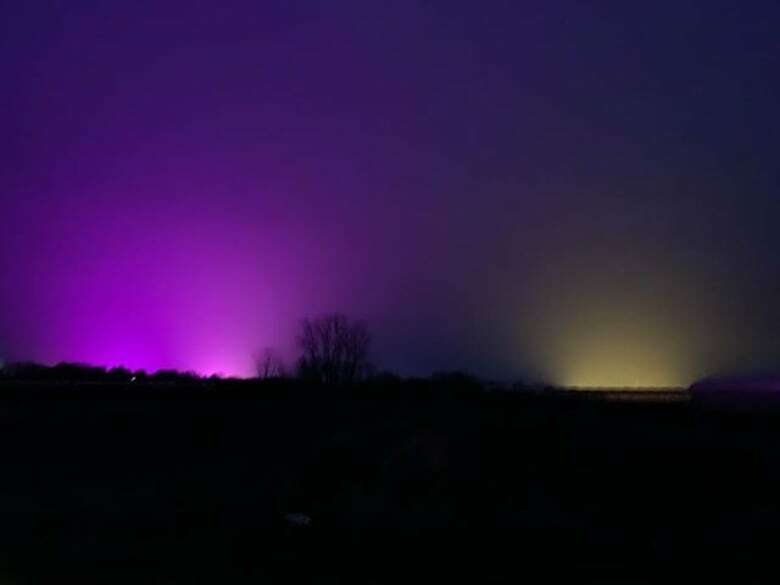 The hues have gotten the attention of residents and has municipalities working to address some concerns about light pollution. "I'm hearing both sides," said Kingsville Mayor Nelson Santos. He explained some residents are concerned from an environmental stand point, in terms of the impact the lights may have on animals. On the other hand, he's heard from others who enjoy them. "Some see the different colours as a northern light kind of experience, and they see beauty in it," he said. "But certainly, the town has taken the stand overall to try and protect the dark sky so that, you know, we don't disrupt mother nature anymore than [has] already happened." He explained greenhouses that grow anything from strawberries, tomatoes, peppers to cannabis use different kinds of grow lights in order to produce year-round. "Certainly there's an experiment going on right now with the different shades of colour," he said. In Leamington, a representative for Aphria told CBC News in an email that the lights they currently use in all of their new greenhouses are LED lights, which is a closer match to the light plants use for photosynthesis — and these lights have a purple colour to them. "They are far more energy efficient and therefore better for the environment. We are not the only greenhouses in the area using LED, but likely we are the largest." Santos said he's also aware of some of those violet glows within the municipality of Kingsville coming from part two marijuana grow-ops as well. 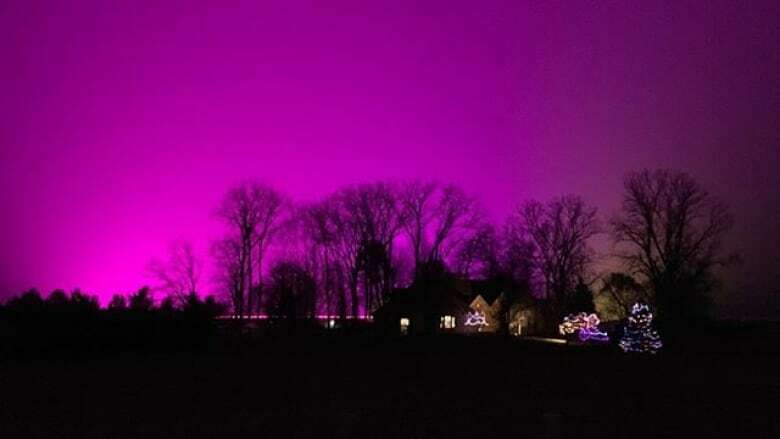 However, to his knowledge, the violet lights are not exclusive to cannabis. Kingsville does have dark sky compliant rules, but right now, they only apply to new greenhouses. Greenhouses that existed prior to the regulations do not have to follow the same rules. However, some of them are making adjustments on a voluntary basis, and others are catching up to the new rules when they apply for expansions or amendments to their original site plan agreements. "So, we're catching up," Santos said. "We even have some commitments from one of our bigger growers to capture their existing greenhouses and have them with these basically darkened curtains to that they aren't intruding into the dark sky." Mucci Farms in Kingsville acknowledges the concerns and said it's not ignoring the public. A representative for the company told CBC News that some dialogue has begun with the Town of Kingsville to figure out the best solutions. The representative also said the company is planning on implementing blackout curtains in all of its farms in the next three years, although it will probably take less time than that. Leamington, on the other hand, doesn't have any light emission rules at this point, explained mayor-elect Hilda MacDonald. She said the municipality is trying to find the best way to address the issue, while still considering the economic side. She said the public has really started to voice concerns around the matter in the last year. Incoming Kingsville councillor Kimberly DeYong said this issue is on her radar. "It is a complaint that I'm hearing, and you know, it would be nice to see the stars again," she said, explaining people are recognizing that things are different from how they used to be. "They don't want to accept that this is their new reality. So they do want to see something done about it."